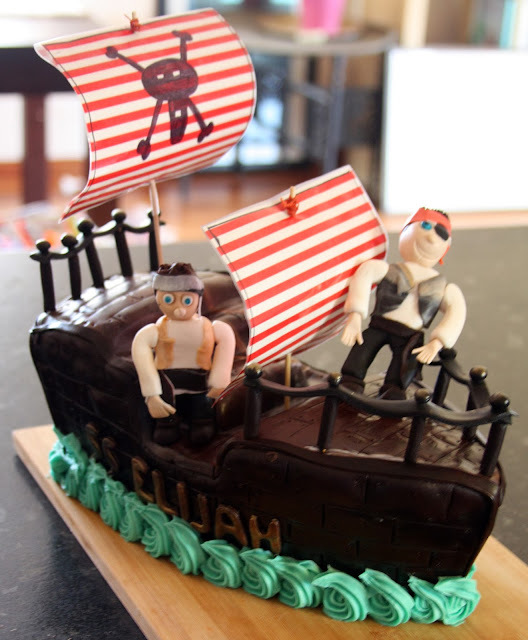 Stella+Olive: [CAKE] DIY Pirate ship cake with gumpaste figures . 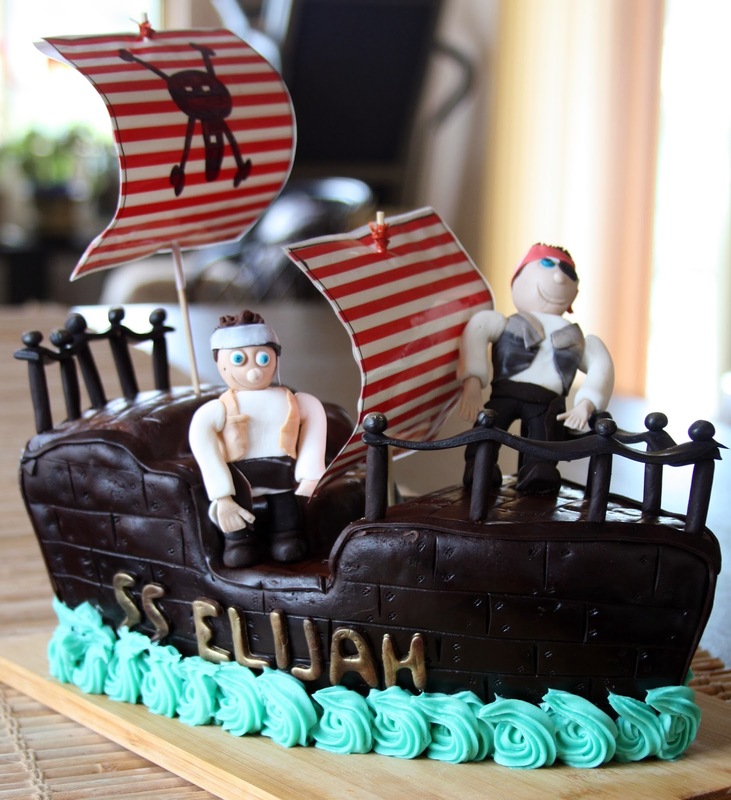 . . . .
[CAKE] DIY Pirate ship cake with gumpaste figures . . . . . I love making kids birthday cakes. 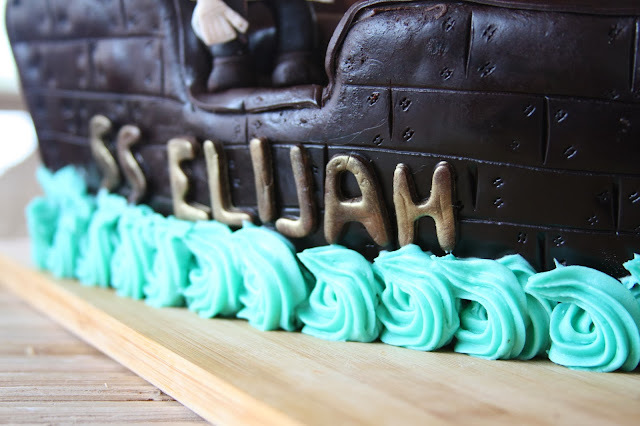 There's never too much colour or decoration and you can really go overboard in a way that isn't really embraced with adult cakes (although it should!). 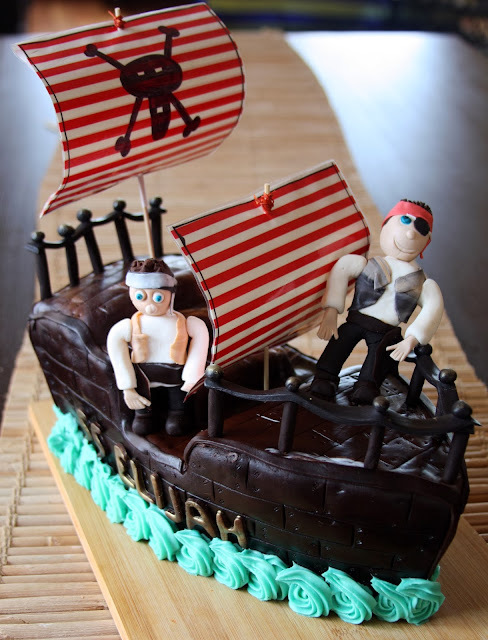 I am lucky to have two nephews who are still young enough to love a decorated cake and usually give me an idea of what they want a month or so before their birthdays. 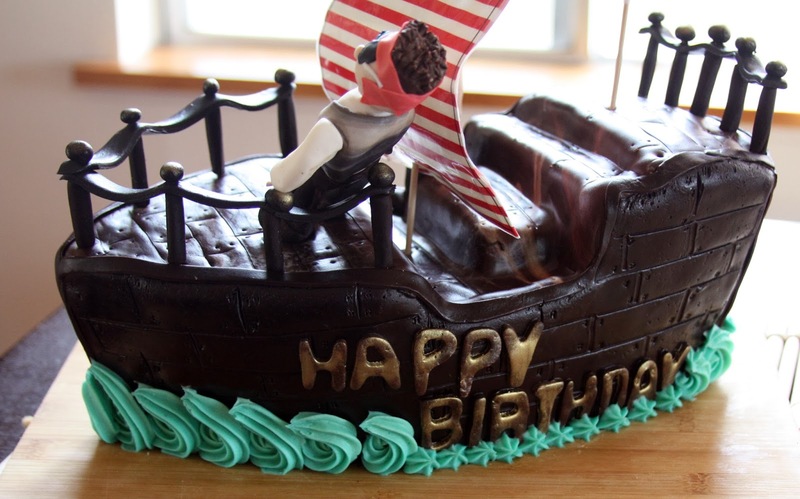 This year it was Mr. Eights birthday and he requested a pirate cake. 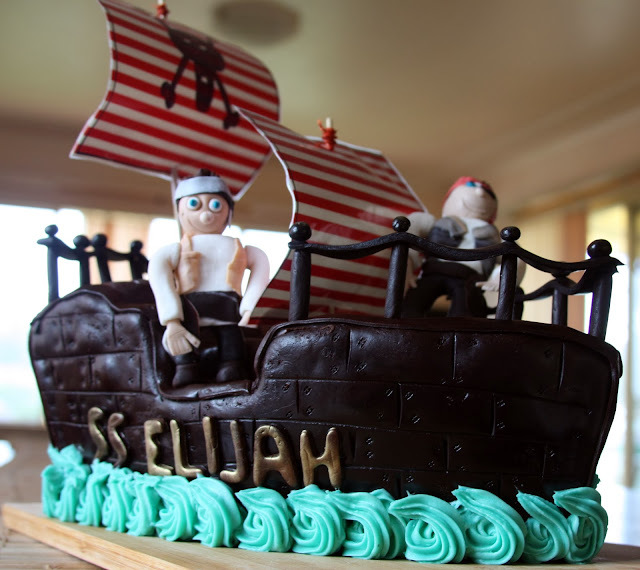 He has had a pirate cake before but it was more of a skull and crossbones theme. 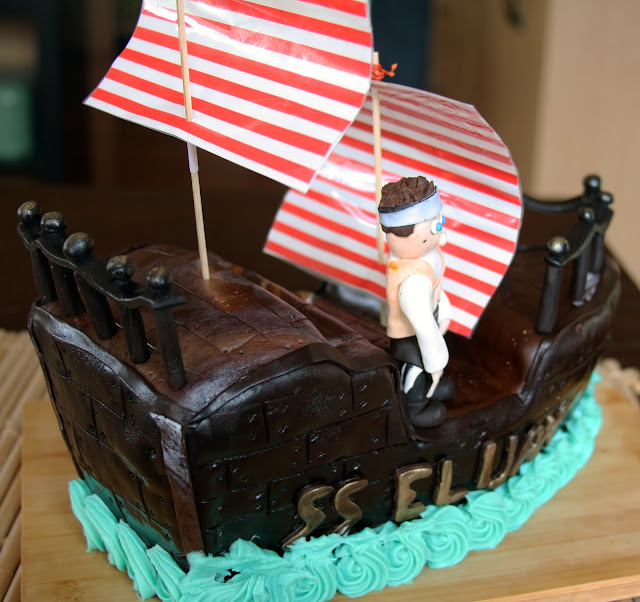 This time I decided to go with a pirate ship as I haven't attempted many shaped cakes. 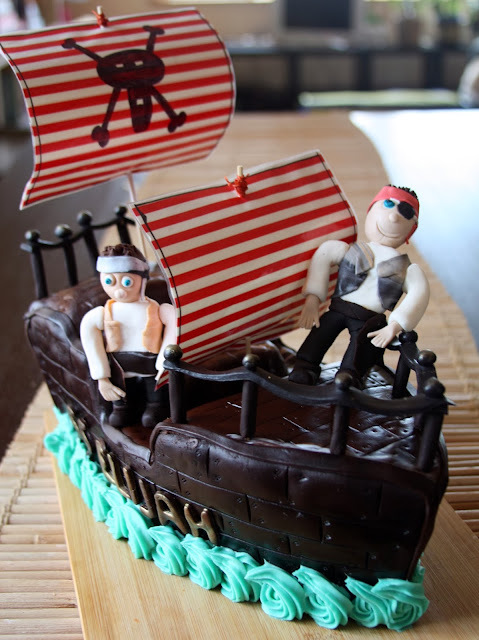 There are heaps of pirate ship cake images on the web but not too many that show step by step how to make them. 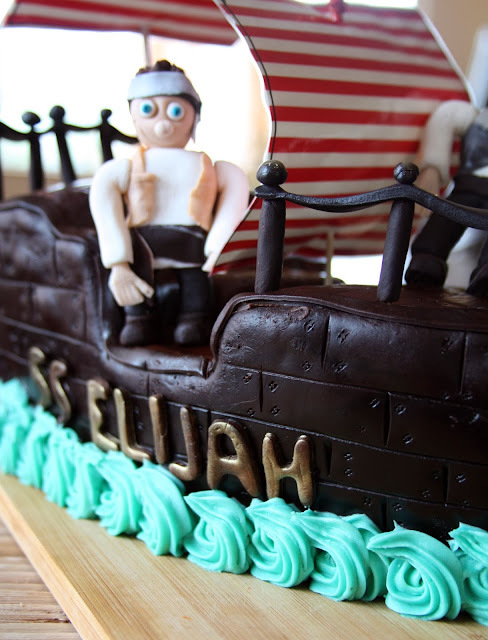 I used these sources as inspiration (number 1 and number 2)for the cake and this blog as a guideline for the gum paste figures . . . . . . although mine were a lot less refined! 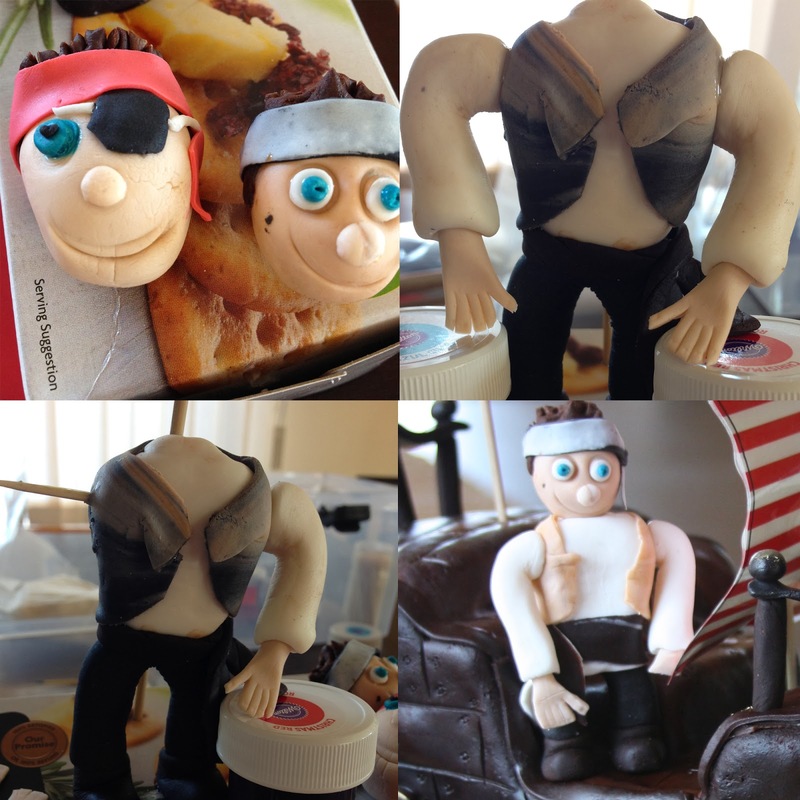 The gum paste figures were made a week before the cake was needed to give them enough time to dry out.That same weekend I also made the cakes for the base and froze them as I didn't have time to do it leading up to the party. I made them in loaf pans and I multiplied the recipe by 3 and it made 6 loaf cakes. 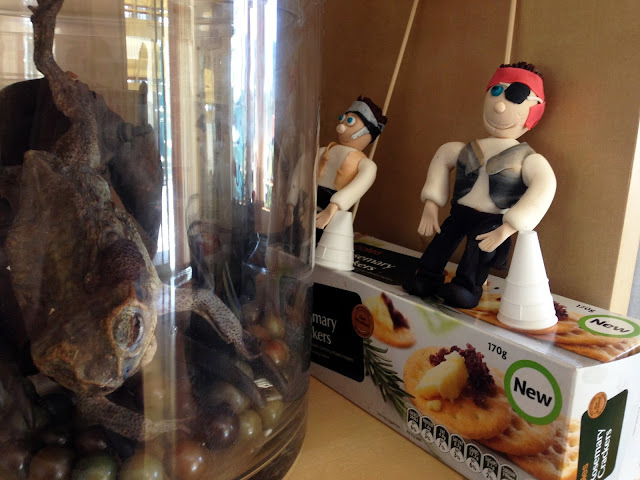 Hanging out with my petrified cane toad to dry. The night before the party, I got the cakes out of the freezer to defrost and made five (FIIIIVVVEEEEE) servings of butter cream from this recipe. 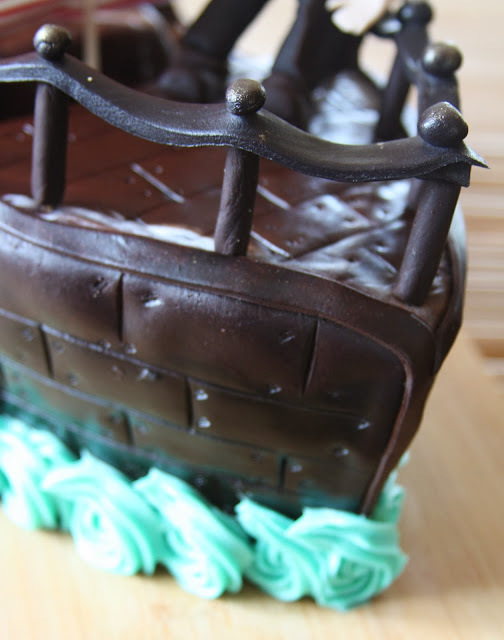 I stacked the cakes into a rough rectangle shape around the size I wanted the ship to be. I then roughly shaped the sides and edges. I took the layers apart, once they were shaped, and started to stack them back together, using the butter cream as glue. At this stage I thought I would never get rid of the crumbs! Do you ever feel like you are being watched . . . . Stella was trying to find a chance to eat some cake. Once they were stacked, I placed a kebab stick in the tallest level of cake as a stabiliser and placed in the fridge to firm up. Once firm, I removed from fridge and finished shaping. Once that was complete, I covered very roughly with butter cream. 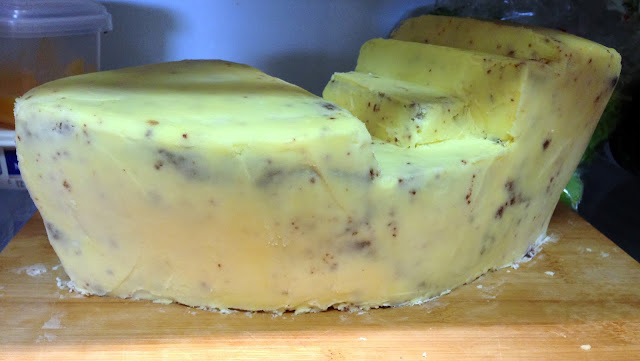 Once covered I placed in the fridge for 20 minutes to firm up then took out and smoothed and added more butter cream to the gaps. Back into the fridge, set, then out again and smoothed with a warm palette knife (place a palette knife in a glass of hot water for 10 seconds, take out, dry, smooth butter cream!). I then left this in the fridge overnight to harden. 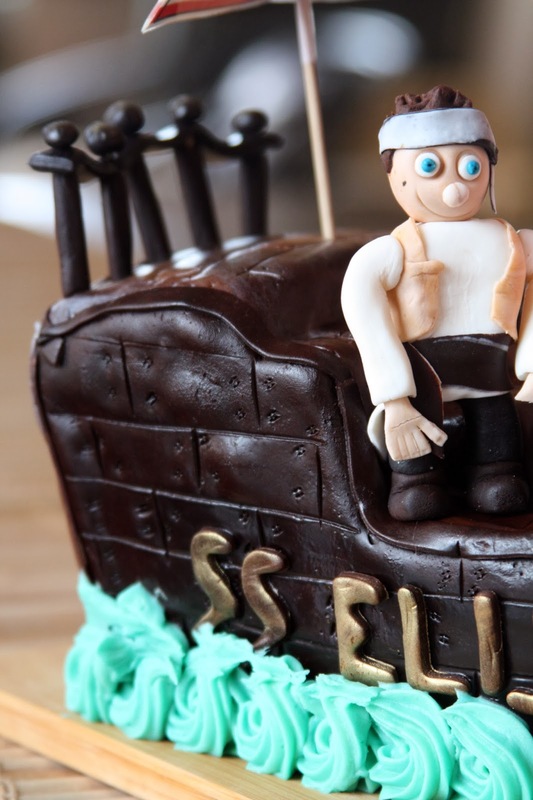 In the morning I rolled out the chocolate fondant for the bottom of the boat. I attached it in 3 segments as I am not an expert with fondant and covering it in one piece was just too intimidating, The sides each had a piece, as did the back. The deck was half brown fondant and half white gum paste that I rolled into snakes and then twisted together then rolled out to give a bit of a variegated wood effect. Once all the fondant was on, I marked the wood panels with a butter knife and a piping tip for the indents. Then on with the flags and the gum paste figures. 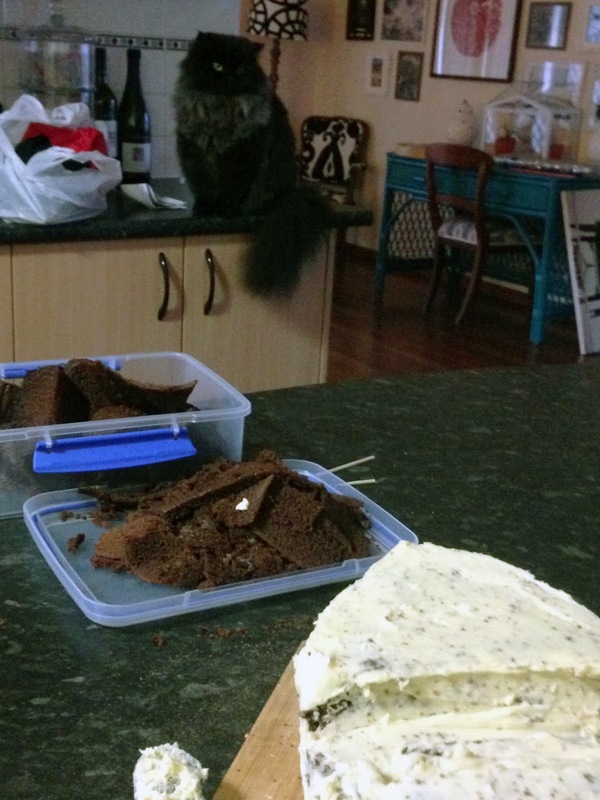 I was really happy with the cake (as was the birthday boy)!